Situated in the Himalayas at an elevation of over 15,000 ft in the state of Uttarakhand, Hemkund Sahib is a much traveled pilgrimage site for the Sikhs. It is located in the highest altitude of the Hemkund Lake (4329 m above sea level) and is surrounded by snow clad peaks and their glaciers. Visited both by Hindus and Sikhs and other communities as well, the very sacred Sikh shrine of Hemkund Sahib is the place where Guru Gobind Singh, the tenth and last Guru of the Sikhs, attained salvation after a prolonged process of meditation in his previous birth. The Guru’s memoirs which contain a comprehensive description of the site helped two devout Sikhs, Sant Sohan Singh and Havaldar Mohan Singh to revive it. According to Hindu mythology, Hemkund or Lokpal as it is also referred to as, is actually where Lakshman had performed meditation. Reached by a 15 km trek from Govindghat (about 275 km from Rishikesh), which is the entranceway to the Bhyundar or Lakshman Ganga Valley, Hemkund Sahib offers a whole range of trekking options. Govindghat is located on the bus route to Badrinath. The trek from here to Hemkund interestingly takes one through deep forests of pine and rhododendron where one gets to woo the wild roses, ferns, and alpine flowers. The surging waters of the Lakshman Ganga are equally placating. The last 5 km of the trek involves a steep climb from Ghangharia, which is a base for visiting Hemkund. The placid waters of the Hemkund Lake which is 2km in circumference reflect images of Saptashringa Peaks (5,500 meters) which surround it. Sleets floating on the waters during the months between July and October offer the best scenarios in Hemkund – one of the finest tourist destinations in India. Approximately 3 km from Gobinddham is located the 5 km long Valley of Flowers which makes for a wonderful visit while you are touring Hemkund Sahib. The beauty of fresh blooms will enchant you to the core and are some of the major tourist attractions in Hemkund Sahib. By Air: Nearest airport from Hemkund Sahib is Jolly Grant Airport, Dehradun, 307 kms. By Rail: Nearest railway station is Rishikesh, 293 kms. 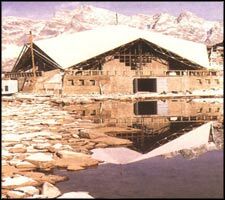 By Road: Hemkund Sahib is located 5 Kms. from Ghangharia, which is reachable on foot from Govindghat which is well linked by excellent roadways and road transport with Rishikesh, Dehradun, Kotdwara, Nainital, Haridwar, Ranikhet and other major hill stations of Garhwal and Kumaon Hills. A wonderful option for nature lovers and religious people alike, Hemkund Sahib draws a large number of tourists from various parts of the country. Log on to www.touristplacesinindia.com which gives online information about Hemkund Sahib, the tourist attractions on your tour to Hemkund Sahib, booking for India travel tours, and tour packages on your tour to India.